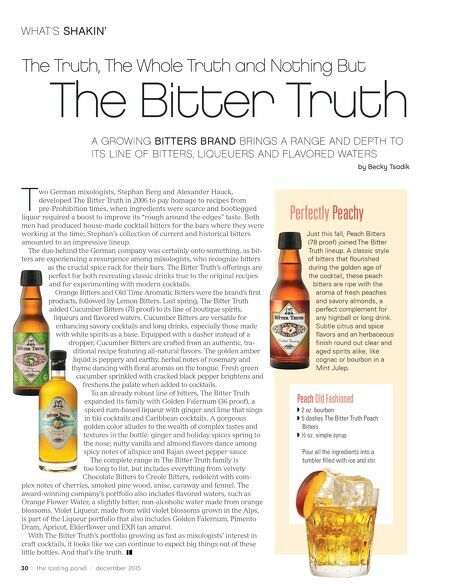 30 / the tasting panel / december 2015 WHAT'S SHAKIN' T wo German mixologists, Stephan Berg and Alexander Hauck, developed The Bitter Truth in 2006 to pay homage to recipes from pre-Prohibition times, when ingredients were scarce and bootlegged liquor required a boost to improve its "rough around the edges" taste. Both men had produced house-made cocktail bitters for the bars where they were working at the time; Stephan's collection of current and historical bitters amounted to an impressive lineup. The duo behind the German company was certainly onto something, as bit- ters are experiencing a resurgence among mixologists, who recognize bitters as the crucial spice rack for their bars. The Bitter Truth's offerings are perfect for both recreating classic drinks true to the original recipes and for experimenting with modern cocktails. Orange Bitters and Old Time Aromatic Bitters were the brand's first products, followed by Lemon Bitters. Last spring, The Bitter Truth added Cucumber Bitters (78 proof) to its line of boutique spirits, liqueurs and flavored waters. Cucumber Bitters are versatile for enhancing savory cocktails and long drinks, especially those made with white spirits as a base. Equipped with a dasher instead of a dropper, Cucumber Bitters are crafted from an authentic, tra- ditional recipe featuring all-natural flavors. The golden amber liquid is peppery and earthy, herbal notes of rosemary and thyme dancing with floral aromas on the tongue. Fresh green cucumber sprinkled with cracked black pepper brightens and freshens the palate when added to cocktails. To an already robust line of bitters, The Bitter Truth expanded its family with Golden Falernum (36 proof), a spiced rum-based liqueur with ginger and lime that sings in tiki cocktails and Caribbean cocktails. 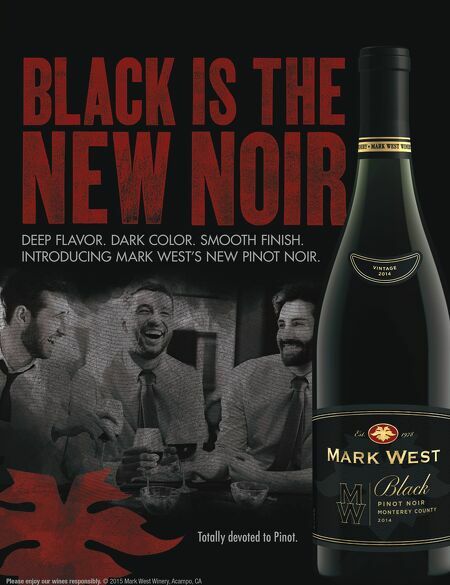 A gorgeous golden color alludes to the wealth of complex tastes and textures in the bottle: ginger and holiday spices spring to the nose; nutty vanilla and almond flavors dance among spicy notes of allspice and Bajan sweet pepper sauce. The complete range in The Bitter Truth family is too long to list, but includes everything from velvety Chocolate Bitters to Creole Bitters, redolent with com- plex notes of cherries, smoked pine wood, anise, caraway and fennel. The award-winning company's portfolio also includes flavored waters, such as Orange Flower Water, a slightly bitter, non-alcoholic water made from orange blossoms. Violet Liqueur, made from wild violet blossoms grown in the Alps, is part of the Liqueur portfolio that also includes Golden Falernum, Pimento Dram, Apricot, Elderflower and EXR (an amaro). With The Bitter Truth's portfolio growing as fast as mixologists' interest in craft cocktails, it looks like we can continue to expect big things out of these little bottles. And that's the truth. A GROWING BITTERS BRAND BRINGS A RANGE AND DEPTH TO ITS LINE OF BITTERS, LIQUEUERS AND FLAVORED WATERS by Becky Tsadik The Truth, The Whole Truth and Nothing But The Bitter Truth Perfectly Peachy Just this fall, Peach Bitters (78 proof) joined The Bitter Truth lineup. A classic style of bitters that flourished during the golden age of the cocktail, these peach bitters are ripe with the aroma of fresh peaches and savory almonds, a perfect complement for any highball or long drink. Subtle citrus and spice flavors and an herbaceous finish round out clear and aged spirits alike, like cognac or bourbon in a Mint Julep. Peach Old Fashioned ◗ 2 oz. bourbon ◗ 5 dashes The Bitter Truth Peach Bitters ◗ ½ oz. simple syrup Pour all the ingredients into a tumbler filled with ice and stir.